We are extremely proud to announce that FESTIVAL OF THE FIRES has received an unprecedented SEVEN nominations at the Irish Festival Awards 2011! We are nominated as Best Small Festival, Best Festival Line-Up, Best Family Festival, Best Service, Best Social Responsibility, Best Irish Act Performance (our pals The Saw Doctors) and Best Toliets. Yes, best toilets. 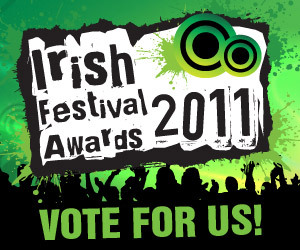 Voting takes place at www.irishfestivalawards.ie in December & January so don’t delay, log onto the site and vote today! The awards are the highest accolade for any Irish festival. They honour the organisers and people behind the scenes that make every Irish Summer such an eclectic celebration of music, art and performance. We are over the moon to have received so many nominations (more than Electric Picnic and Oxegen) and we hope you’ll all spread the word and vote for Festival of the Fires. To be in the same category as big hitters like Electric Picnic, Body & Soul or Oxegen is an honour enough, but to receive more nominations then them is even better. It’s proof that good community events are what the people remember. And what’s even better is that these awards are decided by the people, so log on and vote and spread the word and get whomever you know to vote! We’re also delighted that our good pals The Saw Doctors performance on the Festival of the Fires main stage has earned them a nomination. They have a great new Christmas single out at the moment, a cover of the classic “Downtown”, so be sure to buy it and get the shams a Christmas no. 1! Another nomination we liked was that of the Helium Festival in Ballymahon in the best One Day event. The guys at Helium helped us out in our first year and we hope their brilliant event goes from strength to strength in the years ahead. This entry was posted on Monday, December 5th, 2011 at 1:46 pm	and is filed under Art and artists, Blog, Festival of the Fires Music, Fire Ceremonies and Parade, Get involved!, Uncategorized and tagged with Festival of the Fires, Helium Festival Ballymahon, Irish Festival Awards, The Saw Doctors, Uisneach. You can follow any responses to this entry through the RSS 2.0 feed. Both comments and pings are currently closed.